When it comes to image viewers, sometimes speed is more important than functionality. 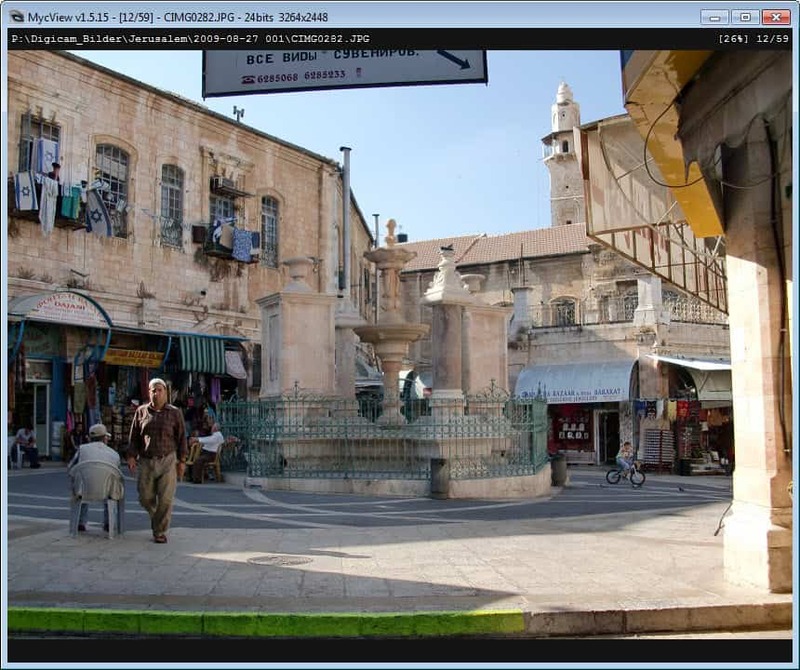 If you want speed and functionality, you are probably picking a program like Fast Picture Viewer which is available as a free and professional version. If you want tiny, portable and speed, you may want to take MycView for a test drive as it is ticking all the right boxes in this regard. Just download the 37 Kilobyte archive from the developer website and unpack it to a directory on your computer. You can then start the program right away with a double-click. Note that the program detects and sets the language automatically. If the language is incorrect, or if you prefer another, you need to edit the config file that you find in the same directory as the program executable. Make sure you change the LangAuto parameter to 0, and modify the language value to the two letter language code (e.g. en for English). You can load photos into the image viewer in a number of ways, for instance by dragging and dropping the image or a folder containing images into the program window, or by right-clicking and selecting the load options from the context menu. A mouse wheel flick, a left-click, page up or down keys, or the left and right arrow keys on the keyboard let you navigate all photos of the current folder, while a middle mouse click maximizes the image viewers window. When you hover the mouse over the image viewer's window, you will see thumbnail views of all images of the selected folder or images right in the footer of the window for fast selection. Here you see the resolution, size and file name. When you right-click, you will also see a number of additional options and mapped shortcuts in the context menu that can help you make the most out of the application. 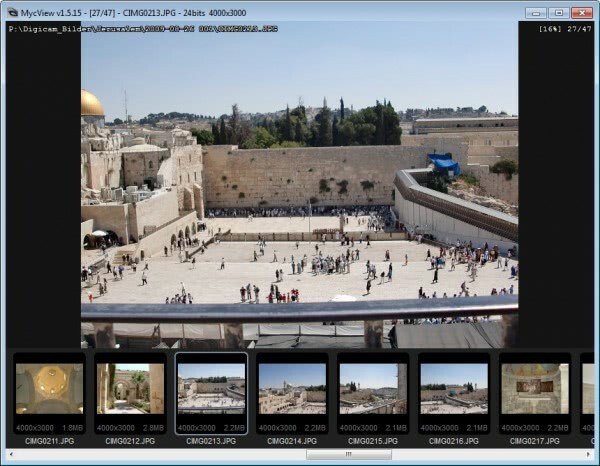 This includes an interesting option to lock the current zoom level so that all photos of the series are viewed in it, enabling a slideshow mode to have the program cycle through all images automatically, or to delete or copy the current image. The performance is pretty good with no visible delay when you switch between images, at least for the 1-2 Megabyte images that I viewed in the program. As far as support goes, the program supports the following image formats: JPEG, PNG, GIF, TIFF, BMP, DIB, RLE, PNM, EMF, WMF, ICO, CUR. MycView has a lot going for it: it is portable, tiny and still pretty fast when it comes to viewing images. If that is all you need, plus a little bit of keyboard magic and some extra features, then you should really give it a try. Thanks for advice, but personally I prefer IrfanView over it. This is small, nice and quite effective, but I also prefer Irfanview, with the plug ins and versatility! It’s not a Full blown graphics program, so yea, there’s no RAW support!! That’s to be expected from a tiny, basic, image viewer! I use AdobeCS a lot, so thats my main, and win7 standard image viewer gets by for quick checks of most things when adobe’s not loaded… but if this programme was able to handle RAW image formats also (esp Canon & Nikon) would be very very useful tool indeed. Looks like a nice tiny viewer. There’s one feature however that’s a must for me, and so far is the only that prevents me from moving from Picasa-JPE Launcher Image viewer: ability to quickly zoom in-out in the place the mouse is positioned with the mouse wheel. anyone tried Imagine? it’s also tiny but more than just a viewer. If I remember well, Martin already reviewed it.